Standard - $29.99 Only 7 left! Let's be honest. Rapunzel's hair, while being full of magical properties, isn't really all that practical for the every day adventuring girl. That's probably why you haven't grown your hair long enough to reach the bottom of a tower. If you plan on joining Flynn Rider on some kind of epic journey, the last thing you need is for your hair to get tangled up while riding through the forest. But don't worry! 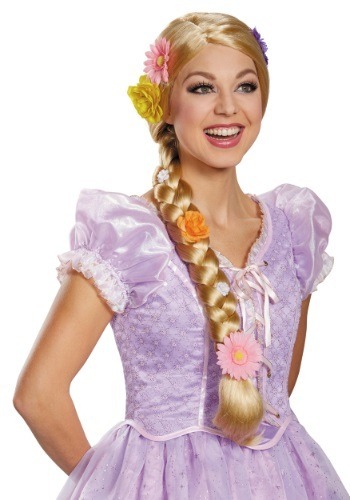 That's why this Adult Prestige Rapunzel Wig will be perfect for you. Based on the animated film, Tangled, this women's wig recreates the Disney Princess' hairstyle, except it's a bit more manageable for every day adventures! It's made of synthetic fibers, which help recreate her classic golden blonde hair and since it's a bit shorter than her locks in the movie and it's styled into a braid, you can easily wear it while you stop Gothel's evil plans.